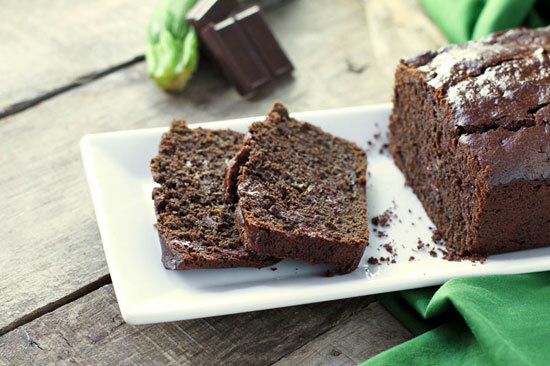 At the risk of becoming a crazy lady who hides vegetables in everything (see last week’s hidden kale smoothie, and my previous post for carrot & pineapple muffins), this week it’s the turn of courgettes (zucchini) in chocolate cake. I’ve also cut the sugar a little by using fruit syrup, and the courgettes help it stay moist without adding too much fat. Delicious, yes, but the test is also how the blood sugar stacks up a couple of hours later: a big slice of this for tea, and coming in at 7.0 before supper, means that this gets added to the ‘make again’ list. In a large mixing bowl, whisk together the flour, cocoa powder, baking powder & bicarb, salt and either the fruit syrup or sugar). Add the grated courgettes and stir to coat. Add the chocolate chips and stir again. In another mixing bowl, whisk together the buttermilk, oil and egg. Pour this mixture into the other ingredients and stir it all together with a wooden spoon, until just blended nicely. Pour the mixture into the prepared loaf tin. Bake for 40-50 minutes or until a toothpick inserted in the cake comes out clean. Cool the loaf in the tin for 10 minutes before tipping it out onto a cooling rack. What a weird coincidence! I made zucchini ( check out how Aussie I am) on Sunday! I should send you the recipe! Full of zucchini and chopped so fine that no one could tell! They are mentally scared, my boys, by the gorgeous mum in laws soggy courgettes as veg at dinner! I’ll need to give your recipe a go! I meant zucchini loaf! I’m not that smart!